We operate a fleet of boats including 4 modern Rigid Hulled Inflatable Boats (RIBs). Our RIBs are designed and built by us at our dedicated workshop. Our more traditional boats are an Evolution 38 (ft) with an inboard diesel engine and a fast Landing Craft for carrying loads to remote corners of Western Scotland. 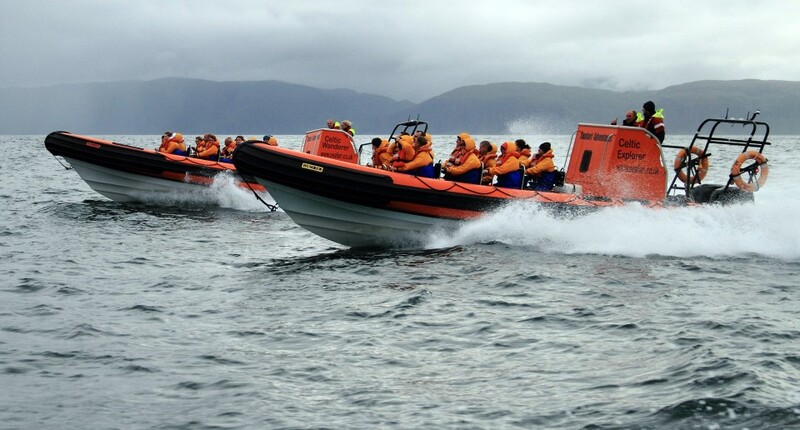 Seafari were the first marine tourism company in Scotland to offer dedicated wildlife RIB trips. Seafari Adventures - all 3 open RIBs together. Our boat test and demonstration area, The Gulf of Corryvreckan, home of the World's Third Largest Whirlpool, is unique. We currently have 3 open RIBs - Celtic Navigator, Celtic Wanderer and Celtic Explorer. Powered by twin 300HP Yamaha outboards, these are the ultimate in wildlife tourism RIBs. There are individual "jockey" seats for all, with room to easily access the seats and all of our open RIBs have parent / child seats at the front so parents can comfortably sit with their smaller children. No passenger is right in the bow of the boat and there are integral steps for safe boarding of the vessel. With our skipper and crew positioned to the rear of the vessel all passengers can be seen by our team throughout the tour. There is no requirement for passengers to walk around the boat to see the wildlife, let our skipper position the boat so you get the best possible view from the comfort of your individual seat. We are always asked about the speed of the vessel. Our aim is to cruise at around 25 knots. These boats, in the correct hands and sea conditions, can achieve speeds of almost 50 knots whilst fully laden. We wish to emphasise we do not demonstrate this fact at any point during our tour. 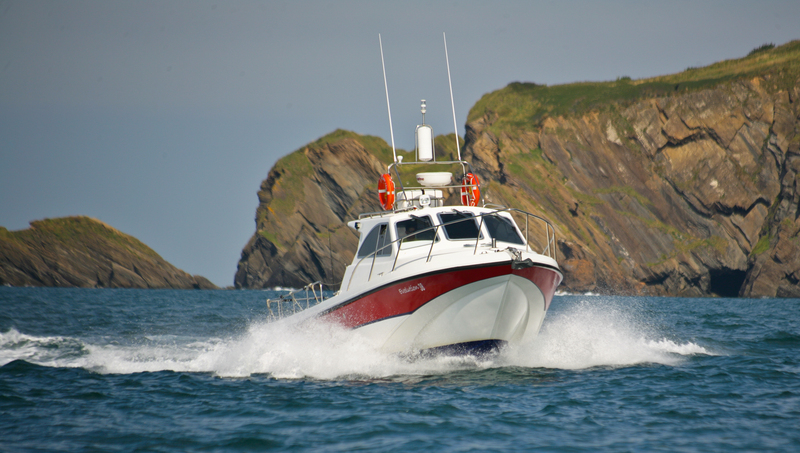 Powered by twin 300HP outboard motors, we describe these boats as similar to our open boats but they have a 'lid' to keep wind, rain and spray from our passengers on longer journeys. It is much the same design as our open boats with individual seats, handholds, etc. however, internally the boats are slightly different. 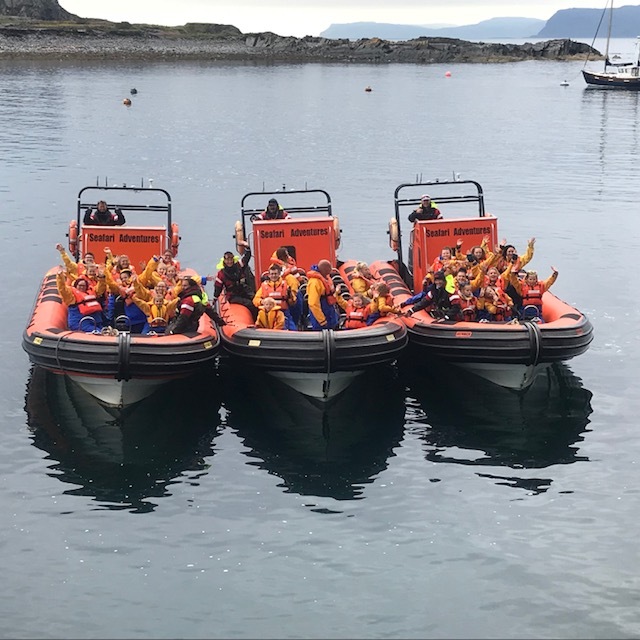 Our cabin RIB, Celtic Voyager, has large windows for easier viewing of wildlife and there is space for our passengers to stand outside at the front and rear, if desired, once we slow down for the wildlife. We use Celtic Voyager for our Day Trips to Iona & Staffa, Private Charters and it is also available during the colder months for Corryvreckan Wildlife Tours. Our associated company Specialised Marine Support also has 2 cabin RIBs, Celtic Nomad and Celtic Guardian which are welcome additions to our fleet as the need arises. Addressing the speed questions again. These boats also cruise at 25 knots but the top speed is slightly less due to the additional hull length and weight of the cabin. However, they would not be classified as 'slow' - These boats have the ability to reach in excess of 40 knots fully laden. Celtic Adventurer, the most recent addition to our modern fleet is a departure from our Rigid Inflatable Boats (RIBs). At 38 ft and with a powerful diesel engine Celtic Adventurer is suitable for longer tours. With a high cruise speed she is ideal for tours focussing on seascapes and wildlife. Sit outside on the spacious open deck or enjoy the view from the comfort of the heated cabin. Binoculars are provided for each passenger. Onboard facilities include a hot drinks machine. The toilet is accessible from the deck. Celtic Adventurer is licensed by the Maritime and Coastguard Agency for 12 passengers and 2 crew up to 60 miles from a safe haven. Full safety equipment is carried including a liferaft. Seafari offer a range of tours of various duration aboard Celtic Adventurer throughout the day. 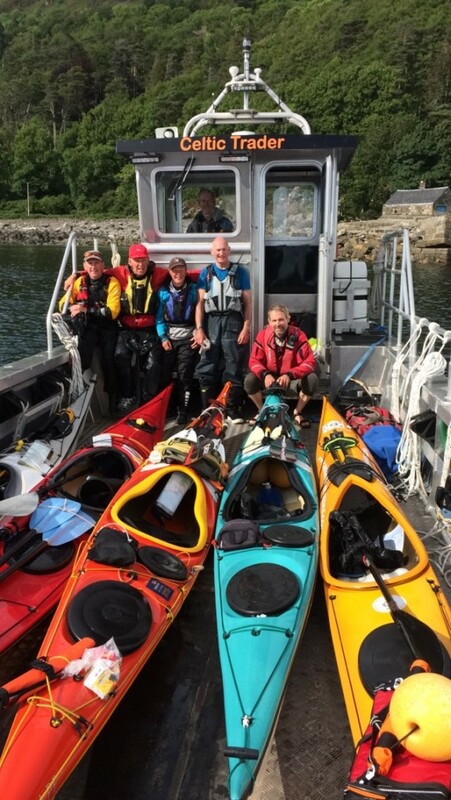 In the summer months we use Celtic Adventurer for our Corryvreckan Wildlife and Whales Tours. Please just get in touch if you want to experience a more leisurely tour. Telephone 01852 300003, email oban@seafari.co.uk or see our online booking system for details. Every tour passes through The Gulf of Corryvreckan, home of the World's Third Largest Whirlpool (weather permitting and it will always be the skipper's decision on the day). Our Landing Craft, Celtic Trader, is available for hire and can be used for multiple purposes. It can carry up to 3 tons of cargo and can cruise up to 24 knots fully laden. Not only has it taken a half ton loom to Easdale Island, helped transport both participants and their bicycles in the Kerrera triathalon event and many other commercial activities it is regularly used by Wilderness Scotland to transport their clients from Jura to the mainland. 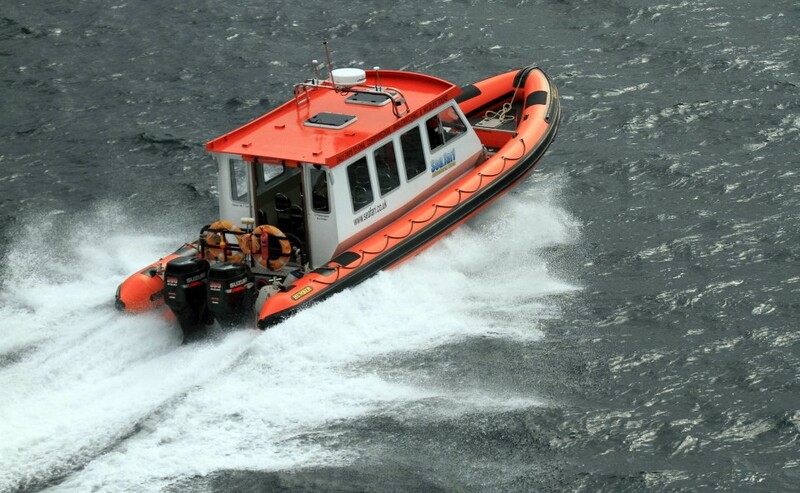 Every RIB has twin engines, the latest electronics and operates to the Maritime and Coastguard Agencies harmonised Code of Practice. Our tourism designs include front seats specifically adapted to accommodate a parent and a child. All our passengers have individual seats with appropriate hand holds. As RIB operators and boat builders, our knowledge and understanding of high speed boats is unique in the UK. We build specialist craft for specific tasks. Along with our tourism experience, Specialised Marine Support (SMS), our commercial charter business, has experience in the commercial boat sector. Recent contracts with SMS include Northern Lighthouse Board, Scottish Fisheries, Sheringham Shoals Windfarm, DCNS/EDF energy tidal turbine testing/deployment/recovery and Briggs Marine (cable laying). By drawing on these experiences we have built specialist vessels for OpenHydro/European Marine Energy Centre and the Scottish Association for Marine Science/National Facility for Scientific Diving. During the winter Seafari occasionally builds custom designed RIBs. The quality of our RIBs and our design advice and build criteria are respected within the tourism and commercial marine sectors.